With fresh data breaches surfacing nearly every day, it’s impossible for one person to keep track of it all. Thankfully, there’s an app for that, and starting soon, it will be even more accessible for millions of users. Earlier this week, Security researcher Troy Hunt announced that his data breach service, Have I Been Pwned (HIBP), will soon integrate with Mozilla’s Firefox browser. A feature found in Firefox Monitor, a new Mozilla security tool, which is currently in testing, enables users to check if their personal data has been compromised by any data breaches logged by HIBP. HIBP allows users to check their email addresses against a vast database of known compromised accounts. Its database currently contains 5.1 billion accounts from 289 breached sites. “This is major because Firefox has an install base of hundreds of millions of people which significantly expands the audience that can be reached once this feature rolls out to the mainstream,” Hunt wrote in a blog post Tuesday. According to Mozilla, roughly 250,000 users (mainly in the US) will be invited to test out the feature as early as next week. 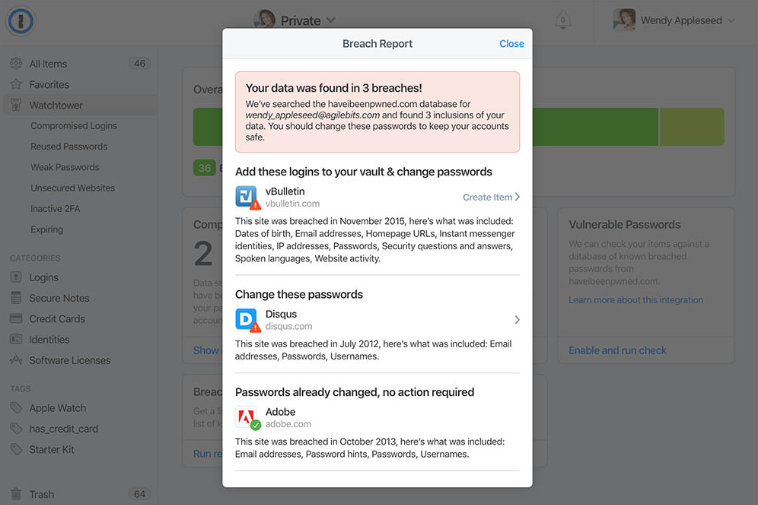 1Password’s Watchtower feature will now notify users whenever an account is flagged by HIBP as having been exposed. This will allow users to quickly change passwords whenever they’re at risk of being compromised.